The demise of a Lankan intellectual belonging to the Tamil community is a sad story. It is sad because the Tamil-speaking people all over the world have lost the rich academic vanguard who directed the directions on vast aspects of cultural studies that includes literature, arts, history, sociology, religion, media studies, translations, theatre and drama, broadcasting and many more fields, and doubly sad for the Lankan minorities because he had some political views though they might have been accepted by a good many people who have divergent views on political situation in this country. He claimed himself as a Marxist and also identified as such by some but he remained a person who was not a steady one in the mechanics of a dynamic democratic process. He had admirers and dissenters. But his intellectual clout was not doubted. It's not the Tamils alone who respected his views but even Muslims and Sinhalas of the left kind knew him and gave him his honours. Son of a Tamil teacher who was a scholar in the village of Karaveddy in the northern peninsula and married to a wealthy lady from Valveddy Thurai, also up in the north, he had three daughters all married and settled one. Coming from rural village, he entered the University of Peradeniya as a general arts student offering history, Tamil and economics. History was his main forte' but he mastered in Tamil and obtained his PhD in Drama from the University of Birmingham under the feet of a great scholar, George Thomson. Although a man from the exclusively Yaalppaanam atmosphere, he adapted himself to suit the changing lifestyles in the south of Lanka. He studied in an exclusive Islamic institution, Zahira College in Maradana and even taught there before climbing to the top ladder via being an interpreter in the Parliament and then to become a don at Kelaniya and Yaalpaanam. A few days before his death the old boys of Vigneswara College in Karaveddy feted him and launched a book called Oru Tamil Aruvadai (A Harvest of Tamil) which recorded some impressions of the late Sivathamby's contributions and activities. Running to more than 200 pages that includes colour photographs of his presence on various occasions. V A Thirugnanasundaram, an old boy of the school and a well known electronic and print media personality. The first 65 pages include articles in Tamil by the late scholar and a profile on him in English. The rest of the book has 17 articles (three in English, one of which is by Prof Sucharitha Gamalath) by various hands. Since we do not have many academics who could write in English on Lankan Tamil Literature, we have to depend on what we could get and gather information written in Tamil on the subject and present them to you through these columns. Revision and up dating of Tamil Educational Glossary Terms Coordinator of Official Languages Commission, Member of the Editorial Committee & Writing a HISTORY OF World Tamil Literature-Institute of Tamil Studies, Chennai, Government of Tamilnadu Project., Member of Apex committee for Standardizing glossary Terms in Tamil, Tamilnadu and Sri Lanka, Chief Tamil Translator: Marga Project on Ethnic Studies, Marga Research Centre, Academic Coordinator: preparation of Teaching Material for teaching Tamil to Tamil migrant children in the Western Countries, Germany, Chairman, 2002 academic Council, International Institute of Tamil Arts.the Institution that holds annual examinations in the field of Tamil Arts since 2000. 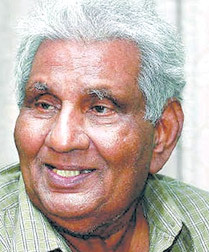 Kathigesu Sivathamby's areas of specialization included: Literary History of the Tamils, Literary Criticism, Social History of the Tamils, culture and Communication among Tamils, Tamil Drama. Sivathamby was not merely a literary figure of giant proportions in Tamil Literature, but he was also concerned person in local political aspects, as we note that some of his works in English bear testimony to this fact. His publications in this field include: Being a Tamil and Sri Lankan, The Tamil Film as a Medium of Political Communication, Tamil Militants in Sri Lanka- a chapter in a book titled The Challenge in South Asia, Tamil Nationalism and Social Conflicts,, Sri Lanka Tamil Society and its Politics,, Understanding the Dravidian Movement, Confronting the Prospects for Peace in Sri Lanka,, Sri Lankan Tamils-Introduction to Their History Culture and Politics (in print) and many more. His Doctorate was on Drama in Ancient Tamil Society obtained from the University of Birmingham in 1970. He has received more than 17 Honorary Degrees and awards. His Visiting Professorships, fellowships, academic assignments number more than 20. At present we do not have among the Lankan Tamil community an intellectual of his calibre. His wide interests were manifold and multi-disciplinary.